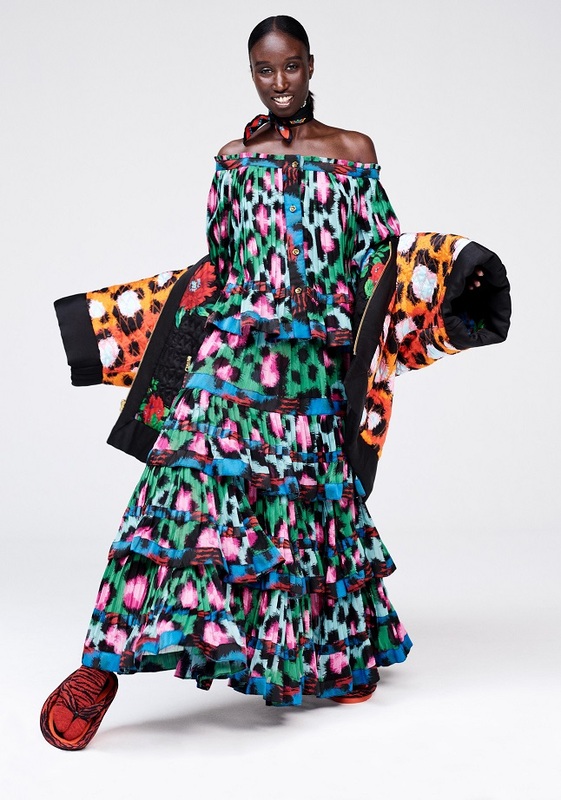 KENZO’s womenswear collection for H&M is a unique celebration of the brand’s vibrant heritage, full of vivid prints, feminine details and playful silhouettes. 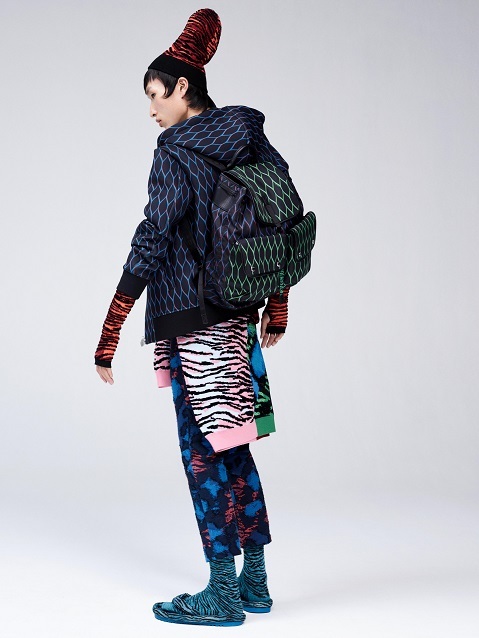 Creative directors Carol Lim and Humberto Leon have filtered the archives of founder Kenzo Takada through their own eyes, giving a modern attitude to the collection. 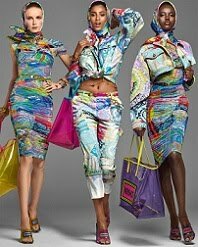 Colours and prints are contrasted and clashed; kimonos inform the cut; ribbons and ruffles give folkloric charm, while sporty shapes add urban energy. 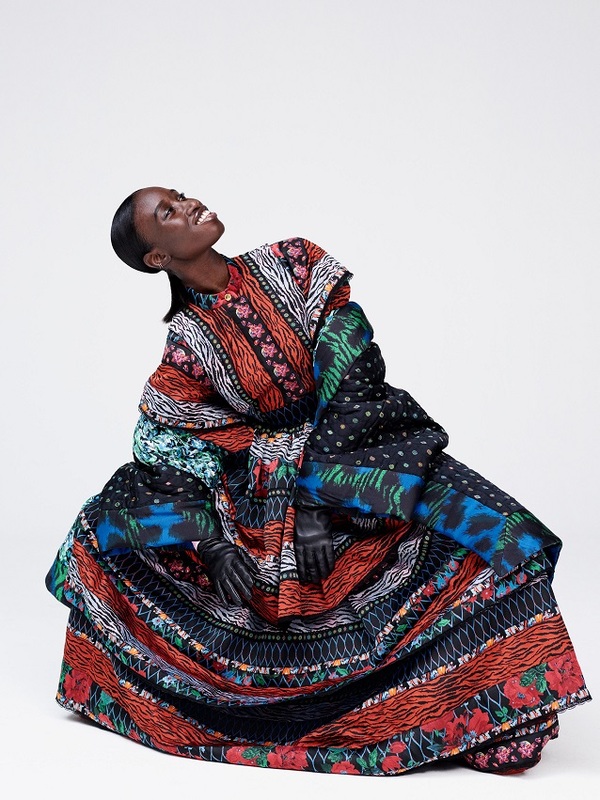 It’s a collection of designs that are totally unique to H&M, both wearable and inclusive while also shining fresh light on one of fashion’s most thrilling histories. 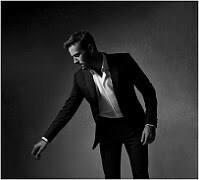 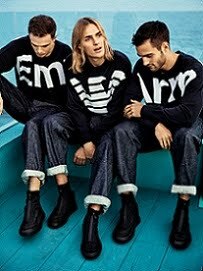 The collection will be available in over 250 H&M stores worldwide, as well as online, on 3 November 2016. 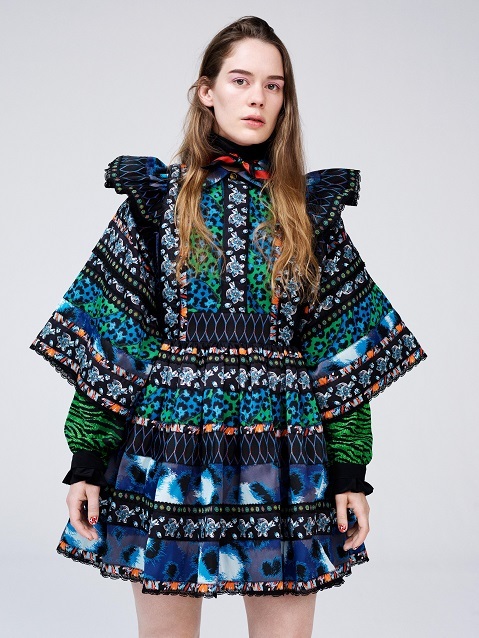 Many pieces in the collection offer a new take on important KENZO archive pieces, like the long tiered dress made entirely from patterned ribbons. 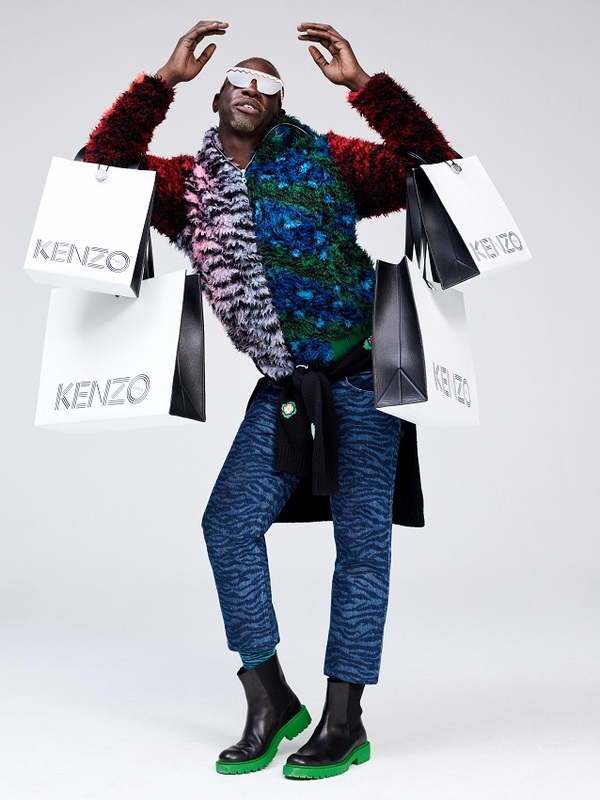 It’s one of the most iconic KENZO designs, and only two of the original were ever made, making this new version a true collector’s piece. 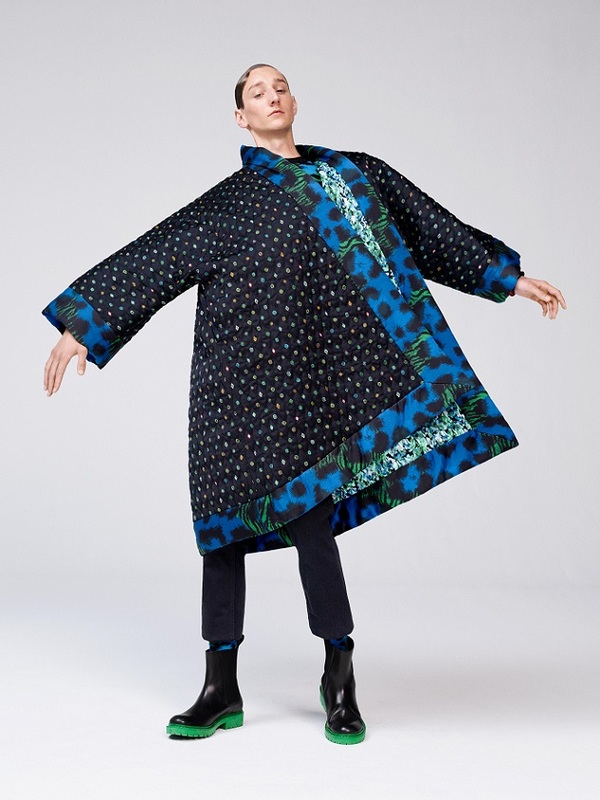 Kimonos were a signature for KENZO, and for H&M Carol and Humberto have created two reversible quilted styles, one a long kimono coat, the other a zip-up kimono blouson. 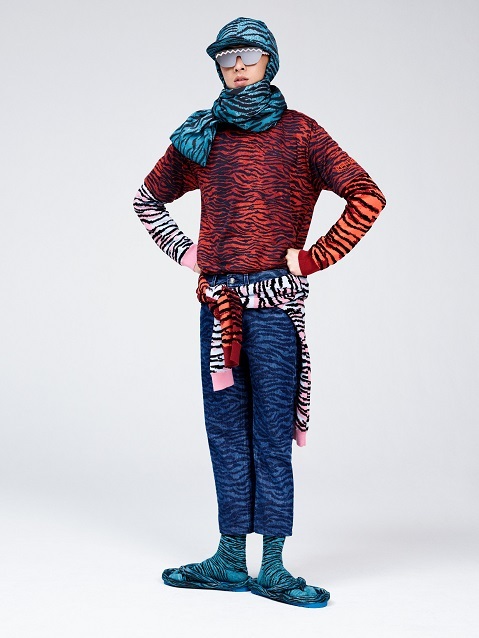 Meanwhile, a classic KENZO look is recreated with a long-sleeve tiger print jersey top and matching tiger print jersey pants. There’s so much freedom and vivacity in the clash of prints that run throughout the collection, mixing together archival prints with those created by Carol and Humberto. 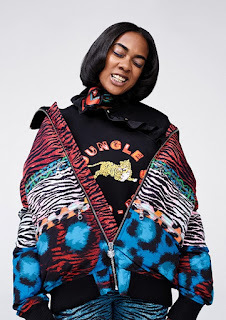 Key prints include the famous KENZO tiger stripes, a mash-up of animal prints, florals, an archive medallion print and an oversized print of mesh. 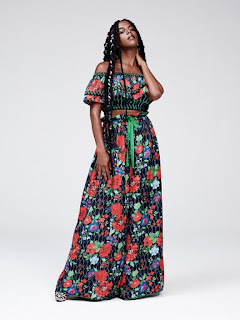 Often there’s more than one print used in the same garment, like the flowing silk dress that combines mesh with floral, or the long tiered and pleated skirt that clashes different shades of animal print. 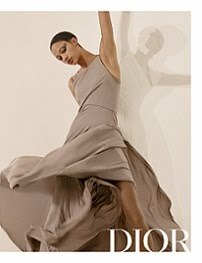 There’s more than one print used in the same garment, like the\ flowing silk dress that combines mesh with floral, or the long tiered and pleated skirt that clashes different shades of animal print. 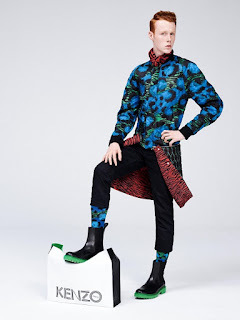 The menswear collection by KENZO x H&M is bold and powerful, a celebration of print, colour and self-expression. 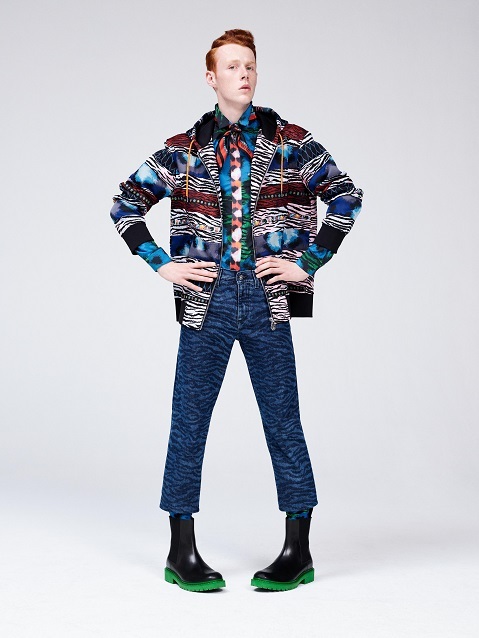 Creative directors Carol Lim and Humberto Leon have selected archival prints by founder Kenzo Takada and reinvigorated them on new menswear classics such as sweatshirts, hoodies, bombers and parkas. The result is a collection of pieces that are totally unique to H&M, playfully mixing colour, print and texture to express true freedom in fashion. 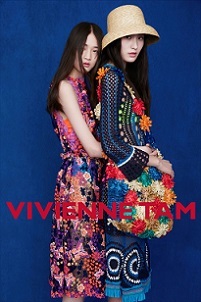 Carol and Humberto have used prints from the KENZO archive to refresh for the first time. 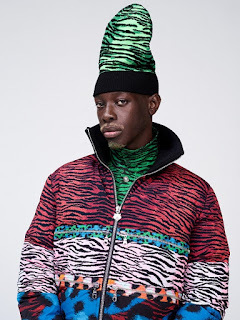 A fake fur hoodie clashes the famous KENZO tiger stripe in different shades with a new animal mix print, while an over-the-head fake fur drawstring waist sweater in green tiger stripe is like a fun take on the outdoor fleece. 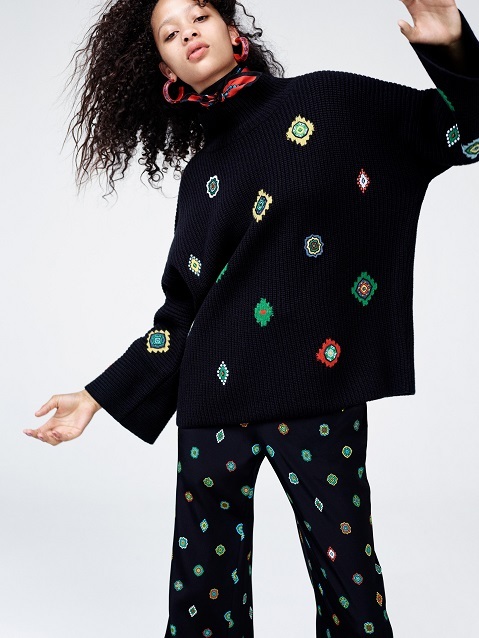 There’s also Carol and Humberto’s medallion print used on an orange T-shirt or as the patches and intarsias on a ribbed knit sweater, as well as their mesh print, like the one in green on a black scuba hoodie, with a hand-sewn beaded logo at the chest. 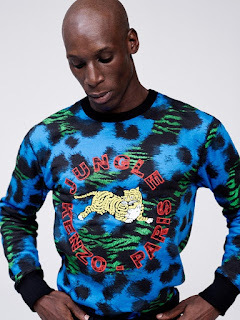 It’s something totally unique to KENZO x H&M: a new patchwork logo adapted from the archives that reads KENZO JUNGLE PARIS, the letters in a circle around a KENZO tiger. 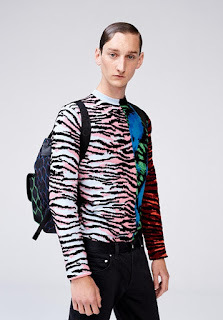 In the men’s collection it appears on a series of sweatshirts, either black, cream or in a clashing animal print, as well as on T-shirts. It’s also patchworked onto the back of many pieces, such as the black padded zip-up leather jacket. 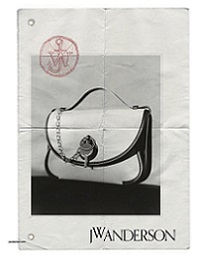 Carol and Humberto are famous for putting their own twist on pieces that fit perfectly into people’s wardrobes. For KENZO x H&M, a reversible nylon print bomber has been extended with its own zip-off panel, meaning it can be worn in so many different ways. 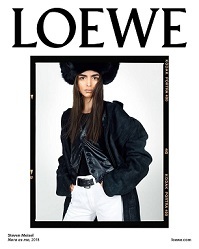 A neat black bomber, meanwhile, is reversible, with the green mesh print on the other side. There are new takes on the parka, either in khaki with a removable printed collar, or padded denim with printed zippers as horizontal trims to seal the pockets. 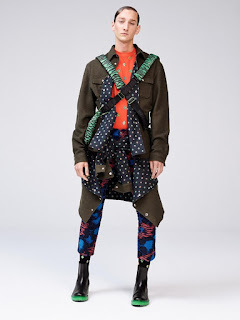 Meanwhile the khaki overshirt is turned into a jacket with medallion print lining and an inner pocket, and a cotton poplin shirt is given new presence in blue and green animal print with an orange-print sporty zip for fastening. 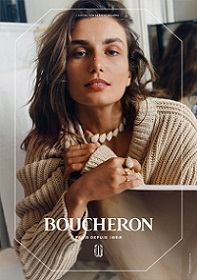 There’s an intricacy to the collection, where every detail has been thought through. 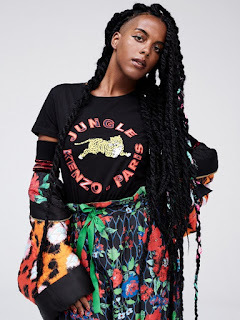 A black T-shirt is hand-beaded with a repeat pattern of the KENZO tiger, while a sweatshirt is handbeaded with a large tiger and the slogan JUNGLE KENZO. 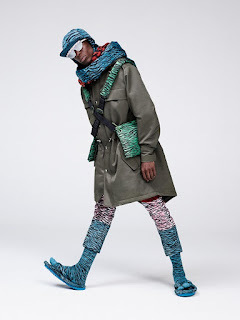 Zips are a key detail, like the silver tiger head zipper pull on a padded down jacket, as well as the printed functional zips that define the horizontal quilting around the body. 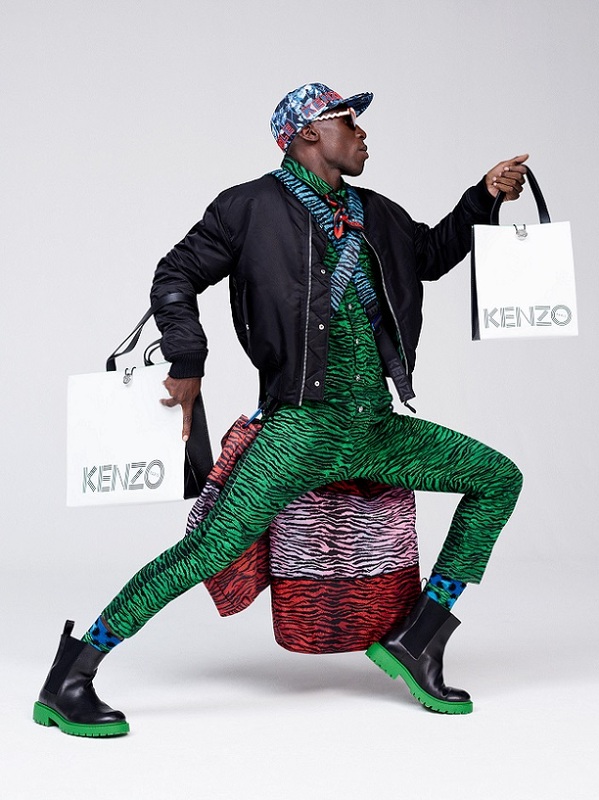 With jeans, whether they’re in a specially woven jacquard of the animal print, printed in block colours of the tiger print, or a solid black skinny fit, each pair features a logo leather patch that reads KENZO JUNGLE PARIS, and a flag tab on the back pocket.